Kim received her Doctor of Physical Therapy degree from George Washington University. 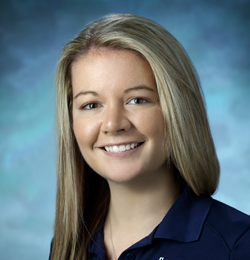 Kim enjoys working with patients of all ages that are recovering from orthopedic and sports-related injuries. Kim has a special interest in treating those diagnosed with femoroacetabular impingement (FAI) and labral tears in the hip. For those attempting to manage conservatively, she will provide education regarding activity modification and exercises/manual techniques that will help to manage your symptoms. If surgery does become necessary, she will guide you through the rehabilitation process and assist you in returning to your active lifestyle. Kim’s treatment approach includes a combination of functional exercise and manual techniques that allow patients to improve their mobility and function, reduce pain, and return to their daily activities and active lifestyle. Kim also provides strategies and techniques for maintenance and prevention of re-injury. Kim enjoys running and cycling. She has completed several half-marathons and one full marathon. An Indiana native, Kim loves watching Hoosier basketball, Colts football, being outdoors, and traveling with friends and family.